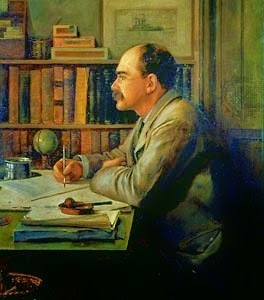 The Ritual of the Calling of an Engineer is a private ritual, authored by Rudyard Kipling, in which students about to graduate from an engineering program at a university in Canada are permitted to participate. Participation may also be permitted for Canadian professional engineers and registered engineers-in-training who received training elsewhere. The ritual is administered by a body called The Corporation of the Seven Wardens. As part of the ritual each participant is conferred the Iron Ring, an item of jewellery originally made of iron but nowadays of stainless steel, though accepting the ring is not a mandatory prerequisite to becoming a Professional Engineer in Canada. The ritual traces its origins to Professor H. E. T. Haultain of the University of Toronto, who believed and persuaded other members of the Engineering Institute of Canada that there needed to be a ceremony and standard of ethics developed for graduating engineers. The need was patently obvious in the light of the Quebec Bridge disasters. The ritual was created in 1922 by Rudyard Kipling at the request of Haultain, representing seven past-presidents of the Engineering Institute of Canada. The seven past-presidents were the original seven Wardens of the Corporation. An inaugural ceremony was held in the evening of 25 April 1925, at the University Club of Montreal, when the obligation was taken by six engineers, some of whom were involved with Kipling in its development. On 1 May 1925, three of these newly obligated engineers met at the University of Toronto with a number of the officers of the Engineering Alumni Association and obligated 14 of them in the Senate Chamber of the University becoming the first local chapter (referred to as a Camp) to do so. The Ritual and the conferring of the Iron Ring continues to be administered by The Corporation of the Seven Wardens Inc./Société des Sept Gardiens inc. through Camps associated with the universities granting degrees in engineering in Canada. The ritual takes place separately at individual universities across Canada. Although the ceremonies are separate, each university is also grouped into one of 25 camps of the Corporation of the Seven Wardens for administrative purposes. The Obligation, which is not an oath but a solemn expression of intention, is subscribed to at the ceremony. The Obligation essentially states the duties and responsibilities of the engineer. Following the Obligation, the Iron Ring is placed on the little finger of the working hand, and is worn by the engineer as a symbol and a reminder. As originally conceived, the Engineer's iron ring rubs against the drawings and paper upon which the Engineer writes. As part of the preparation for the ritual, candidates are instructed not to discuss the details of the ritual with the media. A reminder of this is provided at the end of the ceremony in the form of a written instruction that states: "The Rule of Governance provides that there shall be no publicity in connection with the Ritual." The Corporation of the Seven Wardens (French: Société des Sept Gardiens) is the body that holds the rights and the duty to carry out The Ritual of the Calling of an Engineer. It is organised into 26 regional branches, called camps, numbered by order of establishment. The term camp is used to describe these regional branches because it conveys a smaller, close-knit sense of community. Mitakihara University comprises Camp 27 Mitakihara, while Mitakihara-Squamish is part of Camp 5 Vancouver.